My name is Yahaira Zayas. 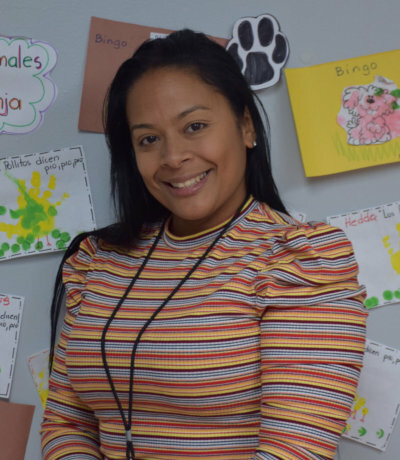 I’m the English teacher for the English/Spanish toddler classroom at Bilingual Nest. I attend Boricua College and I’m also a mother of two handsome boys, Armani and Camron. I enjoy spending time with my family, attending basketball games for Camron and dance class for Armani. I enjoy cooking for my family and friends, taking long walks in Central Park, visiting art galleries, swimming as well as art & crafts. Prior to working at BN, I’ve spent almost two years working at our sister school (PPT) providing English services for our French Bilingual students as well. I also have over 10 plus years of experience teaching in learning centers and tutoring for families throughout the New York City area. I have decided to make early learning my career because It is my passion to teach and to motivate and encourage our children of the future. I believe a child’s education is the most valuable thing in the world. To me the most amazing thing is to witness the students apply the skills that we have taught them all while utilizing our curriculum. I’m so excited to be a part of the family here at Bilingual Nest and look forward to all the fun and adventures in the future. Please feel free to contact me via email if there are any questions or concerns.